I LOVE the Country Bear Jamboree! I have been clamoring for its return ever since Winnie the Pooh and friends took over their theater. I’d be more bitter if it wasn’t such an adorable ride. And to be fair, the Imagineers did pay tribute to this classic Disneyland attraction. Max, Buff, and Melvin can still be seen if you look up and back as you exit the dream sequence in the Pooh ride. But its not the same. 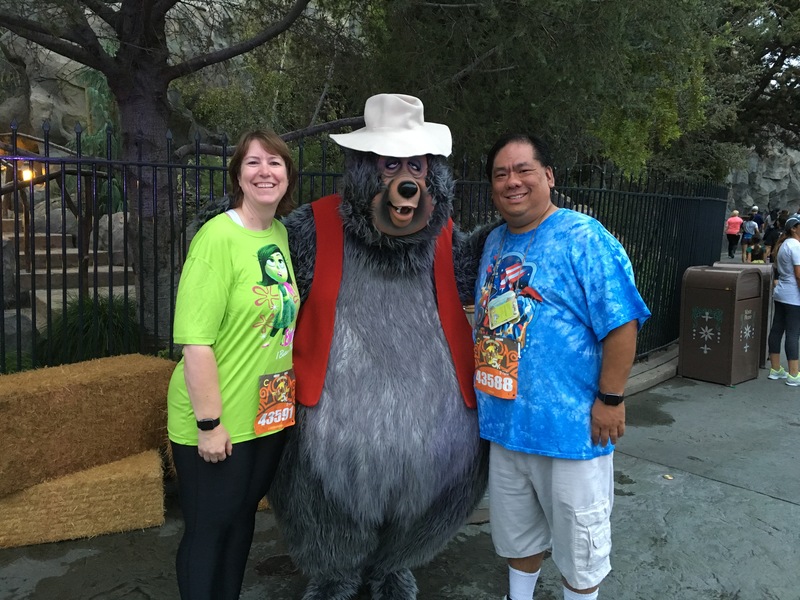 Disneyland has been lacking in Country Bears…until this weekend! runDisney’s annual event – the Disneyland Half-Marathon Weekend – featured classic duos as the theme in each of its races. The Kids Race had Timon and Pumba. The 10K had Aladdin and Genie. The Half-Marathon had Mickey and Pluto. And the 5K (which I “ran”) had Big Al and Liver Lips McGrowl! These two in particular are rarely seen, especially since the attraction left the park back in 2001, so it was particularly cool to have them featured on shirts, pins, and even the race medal. To top it off, both Liver Lips and Big Al could be found along the race route for photo opportunities. Of course, we had to stop at least once. The entire race was great fun. Lots of people dressed up in costume. Some of them quite inventive like the pair we saw dressed up as broomsticks from Fantasia! Others had creative Disney bounding runners outfits like the Cheshire Cat. And of course there were a few dressed up as famous Disney bears – including Henry and Trixie from the Country Bear Jamboree. Families came out to race together including quite a few more kids than I saw last year. There were friends racing together, mothers and daughters, and some like me and my wife, Cassie. My awesome New Balance Mickey shoes! We went to the runDisney Expo the day before and that was lots of fun, too. Featuring great products of every kind you might need for your run, they had stylish running clothes, inventive ear buds, something called The Stick which does wonders for your muscles, and of course my favorite New Balance shoes and accessories. 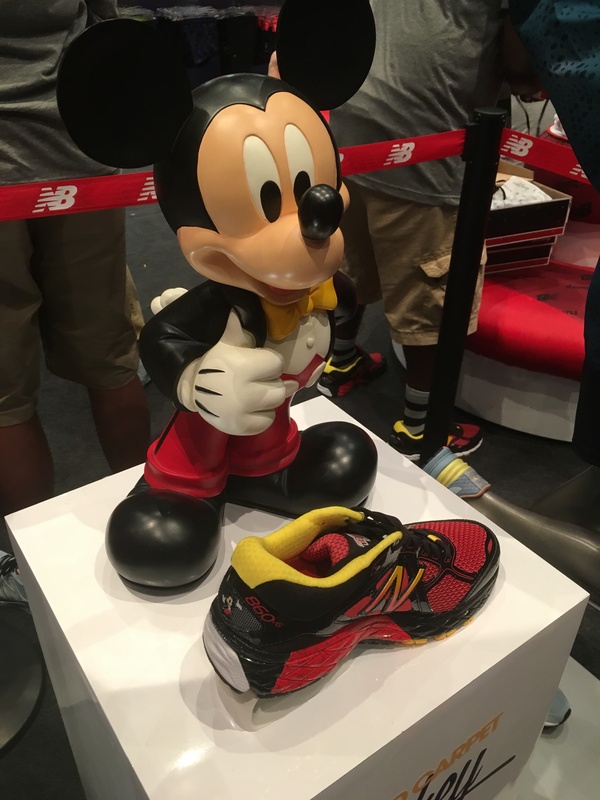 If you didn’t know, New Balance offers special running shoes at every Disney running event and they only sell them for that year. Each year sees a new set of styles designed for the races and after much persuasion I bought the Mickey Mouse 2016 pair of running shoes. My wife swears they are for 8-year old boys, but they were the best fitting shoe I’ve had on in a long time, and come on – they are Mickey! On top of that they had photo ops, free prizes, free samples, and friendly people. The highlight of the Expo for me was the Official Race Merchandise Store where you could buy pins, shirts, Vinylmation, and all sorts of other goodies. They even had a Disney artist creating hand-drawn pictures featuring the 2016 race characters. There was no shortage of cool stuff to get, but some items do run out so if you participate in a race, go to the Expo early to get your best selection of stuff. We stayed this year at the Disneyland Hotel which made it super easy to roll out of bed, get to our corral and walk back afterward to take a well deserved (and needed) shower. We even got to meet up with my friend John and compare experiences. I’m already planning for 2017. So the Country Bear Jamboree may not have fully returned, but it was nice seeing the bears back in the park and getting their due. It was super cool to have photo ops with the famous bears as well as other Disney bears like Brer Bear and Duffy. But most of all it was fun to share this experience with my wife who is my own famous duo! 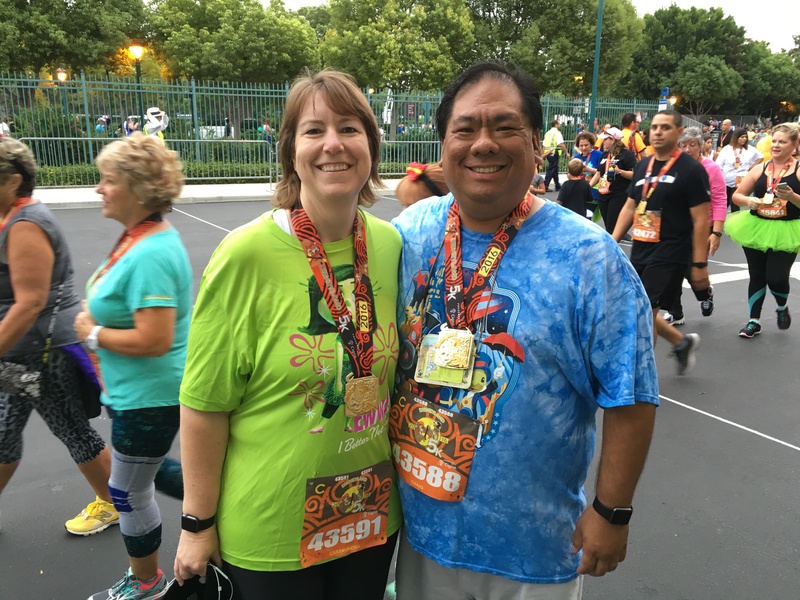 Read about my race experience from last year for Disneyland’s 60th anniversary. Sounds like you had a great time. Like you I am a lover of the Country Bear Jamboree and miss having it in the park. I hope they have this theme again for future races.